The inflammation of Crohn disease is nearly always found in the ileocecal region. 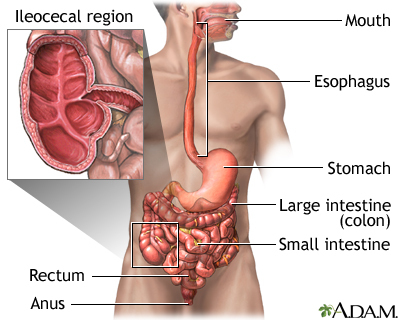 The ileocecal region consists of the last few inches of the small intestine (the ileum), which moves digesting food to the beginning portion of the large intestine (the cecum). However, Crohn disease can occur anywhere along the digestive tract.